"We just heard a report that two man made satellites had collided over north eastern Russia, an American satellite and a Russian satellite. Lots of debris resulted from the crash. It happend on Tuesday, the report said." 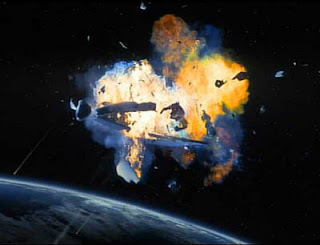 Artist's conception of a satellite collision. P.S. Colleen and Philip heard this news item too and had an idea the USA and Russia are both ashamed it happened to them. Space debris is an increasing problem as more and more satellites and debris from broken satellites clutter the orbital space around our planet. I doubt the countries involved were ashamed; the Russian satellite was a spent one and likely there was no way to control it.